Dominic Arsenault's Super Power, Spoony Bards, and Silverware cuts through the nostalgia so sharply that it comes off as dismissive, hostile even, at least to someone used to reading the flowery prose of fan literature. There's a constant danger to writing about classic video games from the point of view of someone who "was there": If one is interested enough in them to write about them, it's almost impossible to avoid the too-comfortable, gauzy lens of nostalgia in the process. For a segment of the population -- mostly boys who were pre-teens to teens at the height of a given system's popularity -- the language of these games and systems seeped into everyday life in a permanent way that's almost impossible to counteract while looking through hindsight. This is particularly true of those fans of Nintendo weaned on the Nintendo Entertainment System and the Super Nintendo Entertainment System, as Nintendo built and developed a fandom that maintained a near-religious devotion to the publisher. For this crowd, the terms "video game" and "Nintendo game" were and are synonyms; everything else was and is noise. Clearly, it's also largely this crowd that writes book-length pieces on the Super Nintendo. Nostalgia isn't just a lens through which to view most of these books, it's the entire point. Dominic Arsenault's Super Power, Spoony Bards, and Silverware cuts through the nostalgia. In fact, Arsenault's cut is so sharp that it comes off as dismissive, hostile even, at least to someone used to reading the flowery prose of fan literature. This is a book that goes far beyond the idea that the Super Nintendo "won" the 16-bit console war with a combination of a wide color palette and some fancy scaling techniques. Arsenault posits that the real reason that the Super Nintendo was as successful as it was, was that aside from the flashy new graphical capabilities, it wasn't all that different from the original Nintendo Entertainment System at all. In fact, it was through Nintendo's need for total control -- control over outside developers, control over publishing rights, control over the information disseminated to the public -- that what was at heart an inferior machine would be hailed the generation's technical marvel. To back up his claims, Arsenault has data. He has machine specs. He outlines the limitations of the machine alongside the various ways that Nintendo would downplay or work around them. He relays all of this to the reader in a manner that bounces between plain-spoken and sardonic. Part of Arsenault's method is to coin terms for processes and concepts related to Nintendo's success that give double meaning to familiar names and terms. Perhaps most prevalent is his re-assignment for the initials "N.E.S. "; rather than Nintendo Entertainment System, Arsenault coins Nintendo's approach to business the "Nintendo Economic System", which is essentially the concept that everything developed and sold for any Nintendo system had to first be approved by Nintendo. The title of the book leads to three more of these terms and definitions. "Super Power" is granted a sarcastic lilt as the Super Nintendo's approach was to do everything the original Nintendo did, only "Super" -- that is, give it just enough of a facelift to make it feel flashier. "Spoony Bards", a term originating in one of Final Fantasy IV's more famous bits of silly dialogue, are those who would "sing" the praises of the Super Nintendo without acknowledging its deficiencies and downfalls. Finally, "silverware", an analogy that points to the video game equivalent of making a meal fancier without improving the quality of the food; really all you have to do is buy some new silverware. Despite the deprecating tone of such terms and analogies, there's something of a begrudging admiration embedded within the pages. Arsenault explains that the machinery behind the Sega Genesis's famously-dubbed "blast processing" was a chip architecture that was far and away superior to what the Super Nintendo could handle, but Nintendo managed to level the playing field with surface-level bells and whistles like a huge color palette and scaling effects. By taking this approach, Nintendo could build its machines for far less, not only staying competitive with (and eventually overtaking) its direct competition on a per-unit measure, but also bringing in far more money per machine sold. 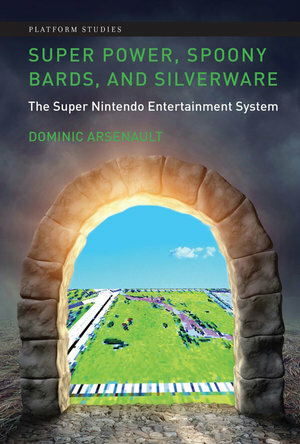 Perhaps most fascinating, at least for someone interested in the games rather than the business, is when Arsenault pokes at the seams of some of Nintendo's sacred cows for the sake of driving home his points regarding the inferior hardware of the Super Nintendo. For example: while "Mode 7" -- a built-in graphical feature that allowed for smooth scaling of background tiles -- was one of the machine's selling points, it took some serious programming workarounds to get it into the foreground for many popular games' marquee set-pieces. Some of the most impressive displays of Mode 7, like Pilotwings, even required the help of an extra chip in the cartridge, even as its scaling and rotation effects were promoted as part of the Super Nintendo system. The use of other in-cartridge chips helped the Super Nintendo keep up as the gaming generation wore on, most famously the "Super FX" chip, which allowed for the manipulation of polygons in a 3D space. Arsenault's book reads smoothly and quickly, and his grasp of the technology at hand is well-researched and fairly fascinating. While Nintendo's policies of controls are certainly documented elsewhere, it's difficult to think of where you can find a better explanation that relates those policies' origins within the company to the way they manifested outward in Nintendo's public face, particularly in the way Nintendo compared to other hardware and software publishers of the time. Mostly, though, it's first shocking, then refreshing, to read about such a popular and revered machine in a way that necessarily cuts away any nostalgia long before it can seep into the story. It's not a hit piece, but it feels like one until you become accustomed to the tone, not to mention the points Arsenault is trying to make. There's enough data in here for it to serve as an inital reference. It's so rare to read a book about a retro system that doesn't spend its time talking about how awesome it was, that doesn't overuse words like "revolutionary" and "groundbreaking". When you find one -- when you find a book like Super Power, Spoony Bards, and Silverware -- there's a good chance you've found something special.